The body mass index (BMI) is your best starting point for health and body weight testing. This test is a very well-researched measurement tool and it only requires a scale. 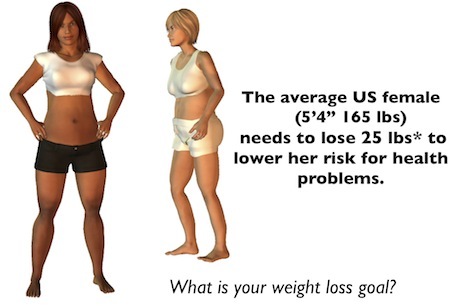 The average US adult needs to lose about 25 pounds. Find out how your body weight compares to your peers using the charts below. Step on your scale, and then see your results on the mens and ladies charts below. When weighing in, be sure your scale is accurate. Remove your belt, shoes, phone, etc. Wear only undergarments if possible. Find your height at the left side of the chart. 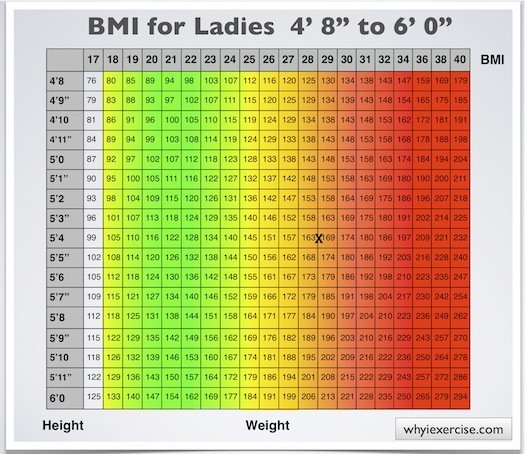 Then find your weight within the chart on the same row as your height. Your BMI is at the top of the column where you find your weight. 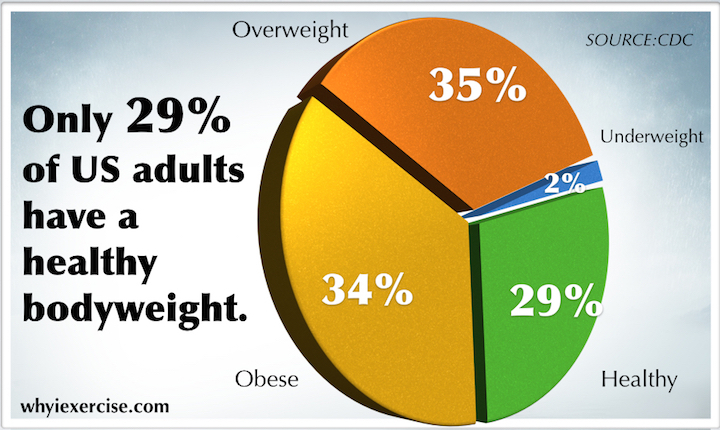 If you are in the obese (red) or overweight (orange) category, your chart shows you how much weight you need to lose to be in the healthy weight category. *The 'Y' on the chart is for the average US male. 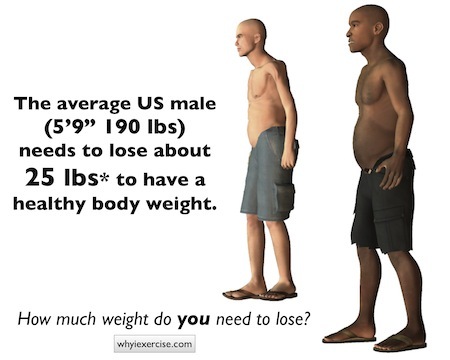 Your weight loss requirements may vary depending the amount of muscle mass in your body. *The average lady is represented by the 'X' in this chart. Waist circumference and waist hip ratio are equally important measurements. One reason you benefit from the other tests is that the BMI can't account as well for differences in muscle mass. For example, if you have a very muscular build, you could get an 'overweight' rating even though you may be in good physical condition. Or, if you are thin but sedentary (you don't exercise), you could get a 'healthy weight' rating even though you don't have enough muscle in your body. For a more complete profile of your body weight, take the waist circumference and waist-hip ratio tests also. Then find your results on the obesity scale, which will analyze your health risk using your body mass index and the results of the other 2 tests. Do you need to lose weight? Regular exercise will burn extra calories and build lean muscle mass, which will improve your metabolism. Begin a new active lifestyle that includes a healthy diet, and you’ll make the changes your body needs for you to be well. Studies show that having a small waist when compared to your hips will give you significant health benefits. Compare your measurements to healthy standards for your gender. Find out how many inches you need to lose for better health. Learn proper waist measurement technique as you compare your waist line to averages for your gender and ethnicity. While there are no specific foods proven to cause weight loss, studies have shown that a nutrient-dense diet significantly lowers the risk for serious chronic disease. You can improve your diet significantly with 11 simple steps. Analyze your results from the 3 body composition tests above, and get a research-based health rating. Find out how every pound and inch of improvement counts. Research on obesity Key scientific findings on the obesity health epidemic. Trends in the statistics and the relationship between body weight and chronic disease are examined. Find out the impact of obesity on life expectancy and cost of living. If you tend to regain weight after starting a diet & exercise program, try a new perspective. Overweight is evidence of a lifestyle that needs to change. See my weight loss tips to get started. Return to physical fitness tests. Return from body mass index to home page: Why I exercise.